The five elementary school pupils on board were not injured, Florida Highway Patrol troopers said. 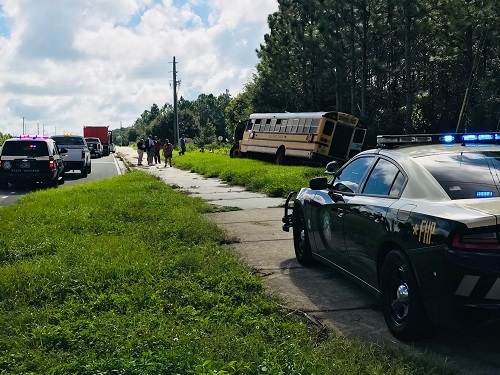 PASCO COUNTY – A Pasco County school bus driver was cited Thursday (Sept. 13) after a traffic crash, the Florida Highway Patrol said. Deanna L. Richard, 50, of Lutz, was cited for failure to yield right of way. She had five pupils from Quail Hollow Elementary School on board at the time of the crash. Neither she nor the students were injured. Yoandy Padilla-Hernandez, 39, of Tampa, the other driver, suffered minor injuries but was not taken to a hospital. The crash happened about 9:08 a.m. at the intersection of Boyette Road and Overpass Road in Pasco County. Troopers said Richard, who was driving a 2007 Pasco County Schools bus, was eastbound on overpass road. She stopped at the sign at the intersection but failed to remain stopped. She drove into the intersection and into the path of the 2013 dump truck that Padilla-Hernandez was driving north on Boyette. The dump truck collided with the right side of the school bus, causing the bus to rotate onto the south shoulder. It came to rest along the treeline.